Peacefully on March 20, 2017 at Boyne Lodge, Carman, Hazel Angus at age 94 passed away. Mom was born January 24, 1923 in Westbourne, Manitoba, the 5th of six daughters born to J.B. (Bob) and Ida Belle Staniland. She lived in Westbourne until she married George A. Angus on July 14, 1942 while he served in the Canadian Navy during the war. Following the war, Mom and Dad lived in Binscarth, Homewood, Brunkild and Carman. Mom was active in various women's groups and volunteered with several charitable causes. At home in Brunkild we would often come home to the smell of freshly baked pies only to find out they were not for us but some community function. Mom was predeceased by her parents, her five sisters, our Dad and our brother Colin George. 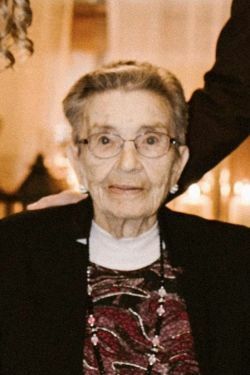 She is survived by her sons Ian Bruce (Bonnie) of Sherwood Park, Alberta and Jeffrey Craig (Michelle) of Winnipeg, as well as seven grandchildren, three great grandchildren and numerous nieces and nephews. Funeral services to be held on a later date at Doyle’s Funeral Home in Carman on Saturday, April 22, 2017 at 11:00 AM. In her later years mom loved to read large print books supplied by the Boyne Regional Library. In lieu of flowers, please make donations to the Boyne Regional Library Renovation Fund, Box 788, Carman, MB, R0G 0J0. Back in 1992, Joan and I purchased George and Hazel's home in Carman, and we remained friends ever since. A month or so ago, we were present at Hazel's 94th birthday party. She was a strong, independent lady with a good sense if humour...and I loved to tease her! She could give it back though, just as strong as you could give it! We had many good laughs together and we'll miss Hazel, as we do George. Our sincere condolences to Jeff, Ian and their families.